I have learnt that in the USA the Labor Day week end happening on the first Monday of September marks the end of summer, which also means a beginning of new art season. So starting from next week – get ready for a bunch of new posts, information about new shows, gallery openings and social events. 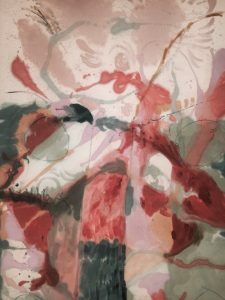 In a meantime I would like to finish summer with the image of a painting by Helen Frankenthaler which is part of MOMA collection and currently on display there on the 5th Floor. Helen Frankenthaler is part of the post war abstract painter’s generation which included Jackson Pollock, Mark Rothko, Barnett Newman and many others. Her work might appear using feminine colors, which I really disagree with. She was using the technic of painting on the floor like Jackson Pollock, but the outcome is much different. It has less randomness and may appear to look like a human body. Its complexity of composition and harmony of colors almost suggest a figurative shape. But at the end it remains a pure washed colored abstraction. I think painting on the floor is the most art respectful way you can imagine. In my imagination Helen Frankenthaler bend her knees with brush in hand, stooping her body, incline her energy towards the canvas. It also requires more physicality and though engagement with painting, so Helen definitely had a different perspective on her creations from the top. The beauty of this particular artwork lies in its lightness, although it is an oil painting one may assume it was executed with watercolors. In contemporary word, painting become a difficult medium to work with for artists, since most of the technics had already been explored and it is hard to innovate. I will pay a specific attention in this new season to the painting in New York galleries and will report soon on what is new, old or popular. In a meantime – let’s enjoy the end of an amazing summer.